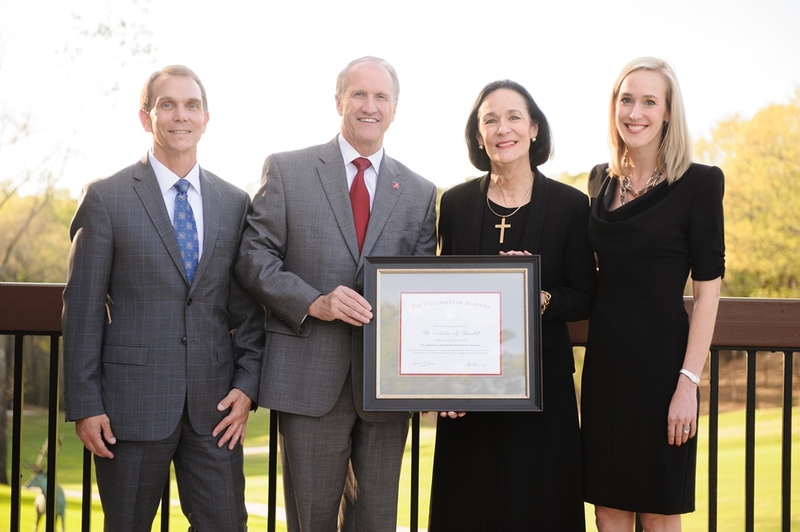 Pictured, from left, are Dr. Shane Sharpe, UA President Stuart R. Bell, Dr. Cathy Randall and Kate Randall Danella. TUSCALOOSA, Ala. — In celebration of its 50th anniversary and in honor of its longtime director who was formerly a student in its inaugural class, The University of Alabama’s Computer-Based Honors Program will be renamed the Catherine J. Randall Research Scholars Program. Recommended by UA President Stuart R. Bell and approved today by the Board of Trustees, the name change will take place in 2018 in commemoration of this milestone anniversary. Created in 1968, the Computer-Based Honors Program, a component of UA’s Honors College, is a nationally recognized undergraduate research program that pairs academically elite students directly with leading research professors and cutting-edge computing technology to complete scholarly research projects in any field of study. In honoring their mother, Randall’s children – Jaynie Randall Lilley, Kate Randall Danella and H. Pettus Randall IV – have directed a significant gift through the Community Foundation of West Alabama that will expand the Computer-Based Honors Program to encourage projects that improve the quality of life for all people. Randall earned her bachelor’s degree, two master’s degrees and two doctoral degrees from UA, and she has served the Capstone in various capacities throughout her career, including 25 years (1980-2004) as director of the Computer-Based Honors Program. Under her leadership, the program flourished, and, today, elite academic students from around the globe vie to experience the research opportunities available to undergraduate students. During their freshman year, Computer-Based Honors students at UA complete an intensive series of courses on complex problem solving, the use of computers, project management and research fundamentals. These skills enable students to learn and adapt to technologies required for faculty-directed research projects. Throughout their sophomore to senior years, program students select a research project in which the student will work closely with a faculty member who will serve as a project director. Students typically will work on projects in areas related to their academic discipline. They may elect, however, to work in an unrelated field to further challenge themselves and broaden their exposure to academic research. “When Dean Shane Sharpe told me that the students wanted to change the name of the program, I was absolutely overwhelmed, as I was at my children’s desire to support in this major way the University that their wonderful father, Pettus, loved,” said Randall. “Dean Sharpe is leading the program to heights never even imagined by its visionary founder, Dr. Charles L. Seebeck. Over the past 48 years, more than 1,000 students have participated in the program. Following graduation, most go on to distinguished careers or some of the most prestigious graduate schools in the country and around the globe.